The General Assembly's new president is a champion for the world's most dispossessed. The revolutionary priest now wears muted diplomatic pinstripes. But Miguel d’Escoto Brockmann, the Maryknoll father who defied the Vatican to serve the Sandinista revolution in Nicaragua in the 1970s, has never lost his passion for righting wrongs or his unshakable Christian faith. He has brought both to an unexpected role this year: president of the United Nations General Assembly. 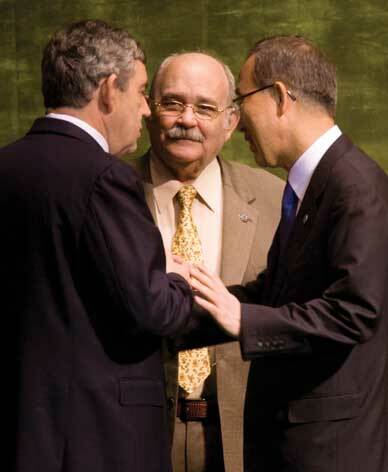 D’Escoto, 75, is by no means a diplomatic novice or a newcomer to the UN or New York. From 1979 to ’90 he was the international face of the first Sandinista government, in which he served as foreign minister under President Daniel Ortega Saavedra after the overthrow of the Somoza dynasty. It was a tumultuous time of civil wars across Central America, and the Sandinistas were hounded relentlessly by a US-backed armed “counterrevolution”–the Contras. D’Escoto took the United States to the International Court of Justice–the World Court–charging Washington with aggression by land and with a sea blockade, and won. The Reagan administration did not participate in hearings, ignored the ruling and declared that the court had no jurisdiction. After Ortega was defeated in 1990 by a center-right party, d’Escoto remained loyal to the movement, and when the Sandinistas returned to power in 2006, he became President Ortega’s foreign policy adviser. “I said, if it does happen, I do it for the more than half of the men and women of this world who are living in destitution, in hunger,” d’Escoto said. “I’ll go there to speak on their behalf–and to promote the cause of peace. And then I said, if I am elected, Lord, help me to be prepared.” A carved wooden bust of Jesus dominates his desk, a novel touch in this UN setting. Perhaps as a sign of the changing times, the United States, which continues to abhor the Sandinistas, did not try to block his election. Zalmay Khalilzad, the US ambassador, said that choosing a president was a General Assembly matter. In reality, there was very little the United States could have done to counter the majority of nations supporting d’Escoto. D’Escoto’s religious education began at a seminary of the Maryknoll missionary order in Glen Ellyn, Illinois, in 1947 and continued at the Maryknoll center in Ossining, New York. While in New York, he also picked up a master’s degree in journalism from Columbia University. He was ordained a Maryknoll priest in 1961 and served the missionary order in the slums of Chile before returning to New York, where he founded Orbis Books, a Maryknoll publishing house. At about the same time, d’Escoto helped organize support among intellectuals for the Sandinista National Liberation Front, which had just been formed. Back in New York again, d’Escoto carries some baggage of recent Sandinista excesses that have cost Ortega the loss of friends in the United States. For years, Ortega has been alienating Nicaraguan colleagues within the movement, who see him as increasingly dictatorial. And wider international criticism of his authoritarian style has been growing. Ortega’s Nicaragua, pandering to conservative Catholics to get the Sandinistas re-elected in 2006, now has one of the hemisphere’s harshest antiabortion laws. Its judicial system has been distorted to be used against critics. The offices of women’s organizations angry over lingering charges that the president raped his stepdaughter have been raided, along with those of other independent nongovernmental organizations. Nicaragua is the only country apart from Russia to have recognized South Ossetia and Abkhazia as independent nations. That said, d’Escoto turns to a sharp analysis of what has gone wrong with the United States and what Washington has done to bring down the reputation of the UN. He starts with American strengths. “I have on the walls here the four people who have inspired me the most,” he said, pointing to portraits he has hung in his UN office. “I’m not talking, of course, about our Lord Jesus, but kind of contemporaries: Gandhi, he’s from India, and two Americans: Dorothy Day of New York–she used to work near here, on the Lower East Side–and Martin Luther King. And on this side, Tolstoy. D’Escoto sees the US invasion of Iraq without Security Council backing as an attack on the UN. “The prestige of the United States is internationally very low. Now it just happens that the prestige of the United Nations is also very low. But this is not a coincidence. The one has dragged the other down. Why? Because people say the Security Council isn’t even able to call its own members to order.” That brings him back to the vexed issue of reforming the Council. With considerable credibility among developing nations, d’Escoto seems to have a chance of making progress. But his problem isn’t only with the “permanent five” nations unwilling to dilute their Council privileges. Developing nations show no signs of agreeing on who should represent them if new permanent seats are added.